Are you sitting at home all alone trying to fall asleep? Are you staring or hoping through your phone praying that it rings? Are you watching a movie that you've seen a thousand times? Maybe playing some Mayer getting lost in your favorite lines? I lied when I said, "I'm leaving and not coming back"
Are you stuck at a red light with a Marlboro Light on your lips? Does the smoke in your mirror get clearer without my kiss? Are you changing the station replacing our favorite song? Will you pick up when I call? Or just forget we loved at all? 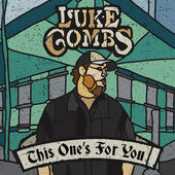 Disco: "This One's for You"
Estamos Escuchando One Number Away de Luke Combs con letra en este video de música online con en el video clip con estilo Country y editado en (2016) e incluido en el disco ''This One's for You''. El tema "Hurricane" es el mas escuchado del CD donde puedes ver su letra y las canciones Top "Hurricane" ,"One Number Away" ,"When It Rains It Pours" ,"Beautiful Crazy" ,.